Susan Haigh was born on Salt Spring Island and has always lived close to nature. Working in oils or acrylic on canvas or board, she creates compositions from her own reference photographs. 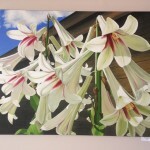 With an eye for the special details that characterize each plant, her paintings are full of light and vibrant colour.